Creator of the NUb cigar, Sam Leccia, has created a unique blend of triple-fermented straight ligero tobacco with a power that is often imitated but rarely duplicated. In case you weren’t aware, ligero is the top part of a tobacco plant. Being the top part, means it gets more sun, and thus more, robust, flavor. What makes Cain cigars so unique is that it features a blend of straight, Nicaraguan ligero from the 3 major ligero regions (which are Esteli, Condega and Jalapa.) That aside, there are choices in taste and flavor to suit everyone’s needs and wants. The Maduro has a cocoa, sweet taste suggesting notes of leather and spice, while the Habano is more nutty…peppery. Convinced? We are. 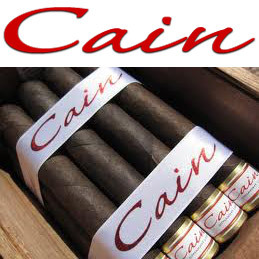 But if you aren’t here are three facts about Cain cigars you can’t deny. Fact 1: 89 Rating from Cigar Aficionado, Fact 2: 90 Rating from Cigar Insider and Fact 3: 91 Rating from Cigar Snob. If you are a fan of Oliva Serie V or NUb Cigars, you should definitely pick up a box of Cain Cigars today.